The Colts head into their bye week at 5-2 after a 39-33 win over the Denver Broncos on Monday night. Today’s news look at the Colts defensive effort against Peyton Manning, Andrew Luck’s four-touchdown night and Chuck Pagano giving Jim Irsay the game ball. Take a look below at the top pieces from Monday, October 21st. Kravitz’s column looks at the “other guys” who got things done in the Colts 39-33 victory over the undefeated Denver Broncos. It had everything to do with the Colts defense, and especially Robert Mathis, who’s been waiting a decade to blind-side and strip-sack Manning. The bruised and battered Indy secondary was extraordinary most of the night – at least until they ran out of bodies — manning up against 18’s receivers, making them work for every yard until late in the second half. It had everything to do with special teams, with Pat McAfee throttling Trindon Holliday and Stanley Havili stripping Holliday, leading to a touchdown. Think McAfee won’t happily pay a fine if one happens to come from the league office? It had everything to do with Andrew Luck, who didn’t put up “Star Wars’’ numbers, but played more than well enough, finishing 21 of 38 for 228 yards and three passing touchdowns plus one running touchdown. Manning got his numbers – he always does – hitting 29 of 49 for 386 yards, three TD’s and one interception. But this night belonged to the Indy defense, which might sound bizarre on a night in which they allowed 33 points, but remains a point in fact. The “noise” and “circus” that surrounded the lead up to the Colts and Broncos never crept into Andrew Luck’s head. Luck completed 21-of-38 passes for 228 yards and three touchdowns ran for another and generally looked like an All-Pro for the first three quarters as the Colts rolled to a 39-33 victory over Manning and the Broncos before 67,196 fans at Lucas Oil Stadium. The four total touchdowns matched a career high. Wells looks at a different angle from Sunday night’s game as Chuck Pagano delivered the game ball to Colts Owner Jim Irsay. That’s why coach Chuck Pagano gave his owner an emotional postgame speech inside the locker room. These Colts (5-2) aren’t the flashiest team, but they find a way to get it done. Game balls could have been given out to the entire offense, defense and special teams. The Colts spent the week leading up to the game not listening to people say they weren’t good enough to hang with the high-scoring Broncos. Veteran receiver Reggie Wayne referred to last week as a circus because of the attention the game got. Ricky Jean Francois is more popular than normal this week around the Indiana Farm Bureau Football Center. The new Colts defensive end played for the 49ers from (2009-2012) and his brain will be picked and prodded by many of his teammates going into Sunday’s matchup with San Francisco. “As soon as I walked in (Monday) I said, I know I’m looking for Andrew Luck. If nobody else asks me something, I said I know it’s got to be Andrew Luck,” Jean Francois said earlier this week. Jean Francois is one of three Colts (Aubrayo Franklin and Cam Johnson) that have recent ties to the 49ers. The Indianapolis offensive line should be asking their fair share of questions to those three as all of them played in the front seven of the vaunted 49ers defense. For his last two seasons in San Francisco, Jean Francois played under head coach Jim Harbaugh. Colts fans watched Harbaugh from 1994-1997 and Jean Francois talks about the former Indianapolis signal caller from a coaching standpoint. 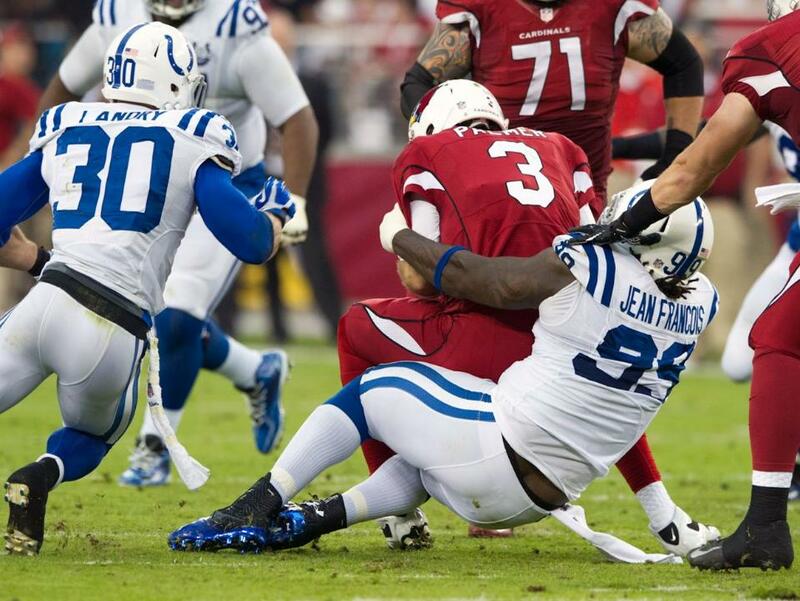 Perhaps more than anyone inside of the Colts locker room this week, Jean Francois knows the task at hand Sunday. “A lot of teams say they want to be in the Super Bowl, play against a team that was in the Super Bowl,” Jean Francois said.